December is a banner month for many small businesses. But with the year-end shopping surge comes a greater risk of shoplifting. So what are the odds that your small business will be hurt by shoplifting? According to the FBI, approximately $116.4 million worth of merchandise is shoplifted per year in the US, with roughly 10.4% of those losses occurring in December. And naturally, some states fare worse than others. So which states have the stickiest fingers? Tsk, tsk. Businesses in these states see more shoplifting losses in December than any other time of year. 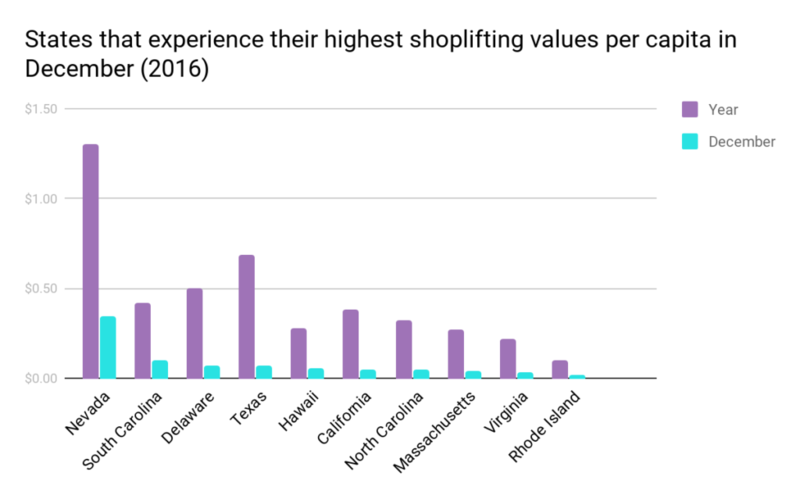 Apparently, South Carolina, Hawaii, California, and North Carolina tend to feel the holiday pressure a little more than other states, as none of them crack the top ten for overall shoplifting during the year but see remarkably high shoplifting losses in December. According to the data, Nevada, New Mexico, and Pennsylvania tend to lose the most when it comes to year-round shoplifting. Tennessee, Texas, and Alabama are also among the worst offenders. Alabama is especially interesting to note on this list because it’s one of the few states where only a minimal number of precincts reported shoplifting numbers for the year. But even with (we can assume) a significant amount of theft going unreported, it’s still the sixth worst state for shoplifting. One thing we can say with confidence? Nevada’s probably not the best place for your small business if you’re worried about shoplifting, as it tops both the year-round and December rankings. Fortunately, there are still some states looking to stay on the nice list. In fact, we’ve got to give credit to three states that really embody the holiday spirit. Sweet, sweet South Dakota, West Virginia, and Oregon. We truly don’t deserve you. Even with the holiday pressure, these states saw their lowest shoplifting rates of 2016 during the month of December. Let’s be clear: people in these states actually shoplifted less during the holidays than at any other time of the year. 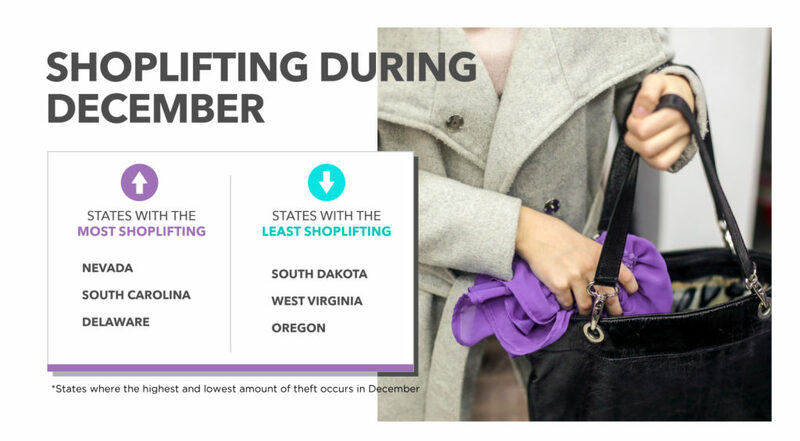 Sure, South Dakota, West Virginia, and Oregon are bastions of virtue when it comes to December shoplifting. But when it comes to year-round shoplifting, sweet little Maine, Idaho, and Montana are truly the US golden children. But here’s the thing: we made our list and checked it twice to make sure we’d adjusted for population. And we still wound up with low-population states like Maine, Idaho, Montana, Vermont, and North Dakota on top. So maybe there’s some truth to the whole small-town charm thing? The only thing in our findings that would seem to contradict this theory is the fact that New York is the sixth best state for small businesses looking to avoid shoplifting. So either the Empire State’s packing virtually theft-free rural areas to make up for higher crime rates in NYC or else the Big Apple isn’t quite the crime-ridden cesspool TV would have us believe. The holidays are stressful for consumers, which often translates to higher-than-normal shoplifting in December. But Nevada tends to stand out as the worst state for shoplifting due to its high year-round and December losses. 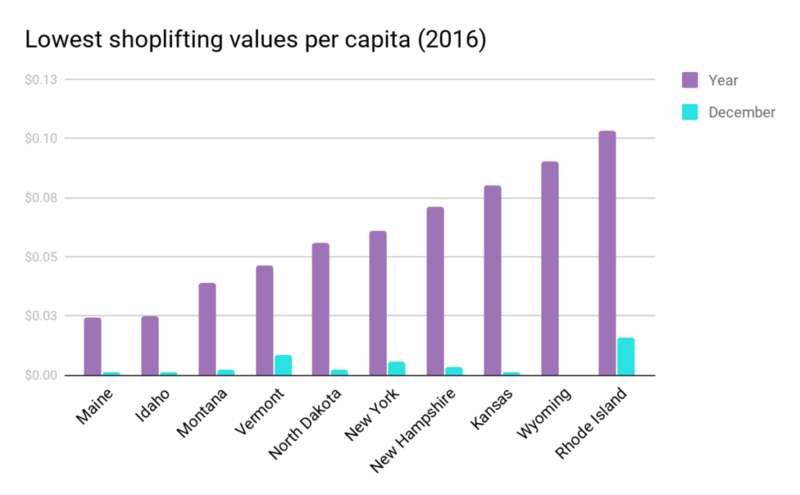 On the flip side, though, businesses in small states like Maine tend to be impacted less by shoplifting, even after you account for these states’ lower populations. 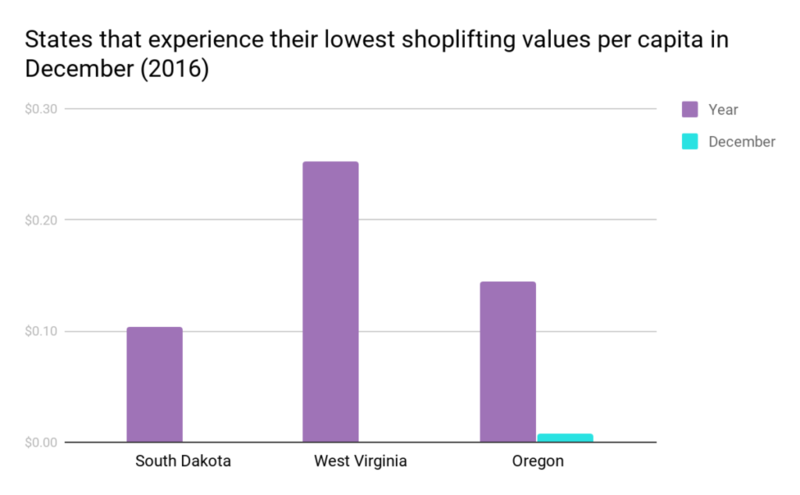 And finally, there are those too-good-to-be-true states, South Dakota, West Virginia, and Oregon, which buck the trend and see their lowest shoplifting numbers in December. Bless them. To get the numbers used above, we referenced the data from the FBI Uniform Crime Reporting Program’s 2016 report on Property Stolen and Recovered in the United States1. 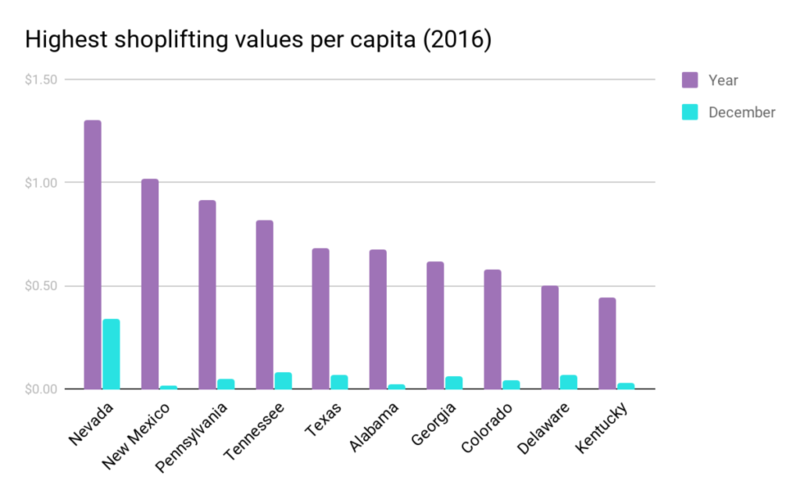 We adjusted each state’s total values and December values to account for population and arrive at a number for shoplifting losses per capita. We excluded Florida from our results above because the state reports its shoplifting values semiannually instead of monthly (which makes it impossible for us to definitively pinpoint its shoplifting rates in December versus other months). We should also note that significantly fewer precincts in Arizona, Alabama, Illinois, Minnesota, and Mississippi participated in the FBI’s report, so the shoplifting numbers from those states are likely lower than the actual losses experienced by business owners there. *Numbers affected by significantly low number of reporting precincts. **Reported semiannually (as opposed to monthly). 1. U.S. Dept. of Justice, Federal Bureau of Investigation. UNIFORM CRIME REPORTING PROGRAM DATA: PROPERTY STOLEN AND RECOVERED, UNITED STATES, 2016 [Computer file]. Compiled by the U.S. Dept. of Justice, Federal Bureau of Investigation. ICPSR37063-v1. Ann Arbor, MI: Inter-university Consortium for Political and Social Research [producer and distributor].